It has long been believed that fish oil may cause a person to bleed more easily, especially if consumed at higher doses. However, clinical trials have not found much evidence to support it. And just like the longtime myth that you have to wait 30 minutes after eating to swim, some researchers and physicians are now questioning whether the precaution is valid. Though the Cherab Foundation some parents have questioned bloody noses and increased bruising in wonder if it’s from fish oil supplementation and the advice is to take their child for a bleeding time test. There has yet to be any cases of children testing to have abnormal bleeding time (and I was a child that used to bruise and get bloody noses and unfortunately for me as could have probably have used their health benefits wasn’t on fish oils) Check with your child’s doctor, but good to be aware of the evidence. 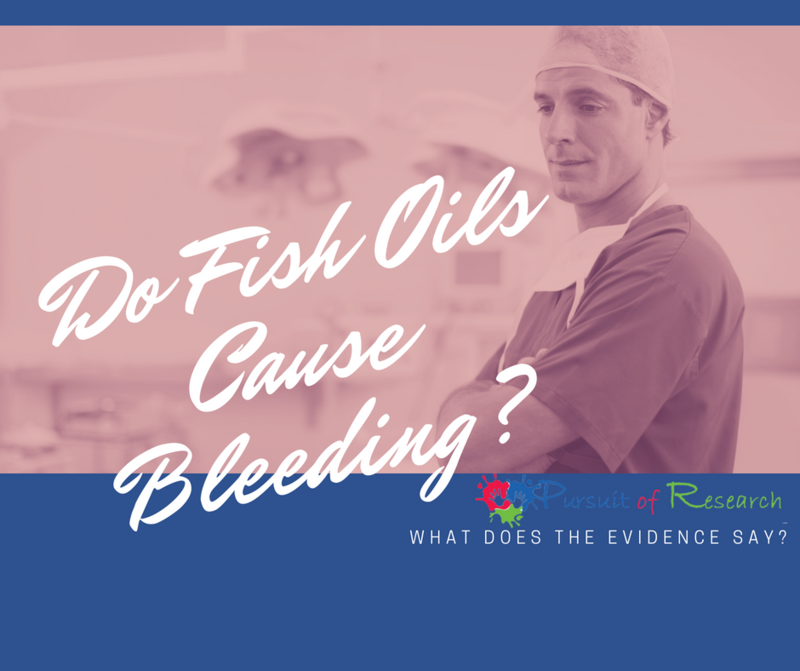 Research quotes answer the question do fish oil cause bleeding? Bill Harris, one of the leading authorities in omega-3 research, doesn’t think so (1). In 2007, Harris reviewed 19 clinical studies involving 4387 surgical patients who were taking fish oil supplements in doses ranging from 1.6g EPA/DHA per day (the equivalent of taking about 4 fish oil capsules or 1.5 teaspoons of Omega Cure) to 21g EPA/DHA per day. In 16 out of 19 studies, the patients were also taking aspirin. And in three of the studies, patients were taking heparin, another common blood thinning drug. The review concluded that the risk of problematic bleeding was virtually nonexistent, even when combined with other medications known to increase the risk of bleeding (2). Another review from 2008 reached the same conclusion. This review stated that no published studies had reported clinically significant bleeding episodes among patients treated with antiplatelet drugs and fish oil at a dose of 3g to 7g per day (2). A more recent review, published online in March of 2017, agreed again. This review found it safe to consume omega-3 supplements, even at large doses of up to 10g of EPA/DHA per day in the short term (3). To put that dose in perspective, it would be the same as swallowing almost ¼ cup of Omega Cure, or taking 30 fish oil capsules daily. That’s significantly more omega-3 than anybody takes on a regular basis. Speaking of which my Mom went in for open heart surgery and her heart surgeon told her she did not have to stop taking her fish oils prior -and the doctor and nurses in the operating room reported that she had very little bleeding during surgery, and we were also told after she healed faster than the norm. Fish oil is not like man-made blood thinners -it works with the body as needed. Dr. Stoll quote answers the question do fish oil cause bleeding? “Post: Is there a downside to supplementing with omega-3? Dr. Stoll: There isn’t. Some people may experience GI distress if they take a large amount of a low-quality supplement. But the highest good-quality fish oil is not rancid and has little or no taste and has no side effects. Another issue that people worry about is bleeding because EPA inhibits platelet aggregation. But we scoured the scientific literature, and there has never been a documented case of bleeding due to omega-3 fatty acids. We recently reviewed about 18,000 people who participated in clinical trials with omega-3s, largely in cardiology studies, and we couldn’t find one instance of bleeding in any of the trials. There was no bleeding, even if used in IVs prescribed before and during cardiac surgery. I think this perception is a myth because omega-3s don’t inhibit the platelets as strongly as aspirinperhaps 60 to 70 percent as much as aspirinand unlike aspirin, the effect is reversible. Post: When a patient is on blood thinners, such as coumadin, should they exercise caution when supplementing with omega-3? Dr. Stoll: In that situation, I usually recommend a lower dose, not exceeding one or two grams of EPA per day. At this dosage, there should be no effect on the action of coumadin. The unanswered question is, together are they providing too much anticoagulation? Nonetheless, there may be some minute risk of a negative interaction with anticoagulants, such as warfarin (coumadin), high-dose aspirin, or ibuprofen-like medications, based on animal data and anecdotal reports in humans. However, large-scale controlled clinical trials with patients receiving omega-3 fatty acid supplements with either aspirin or warfarin observed no cases of bleeding even after one year of the combined treatments. SOURCE: Saturday Evening Post, May/June 2005, by Patrick Perry. 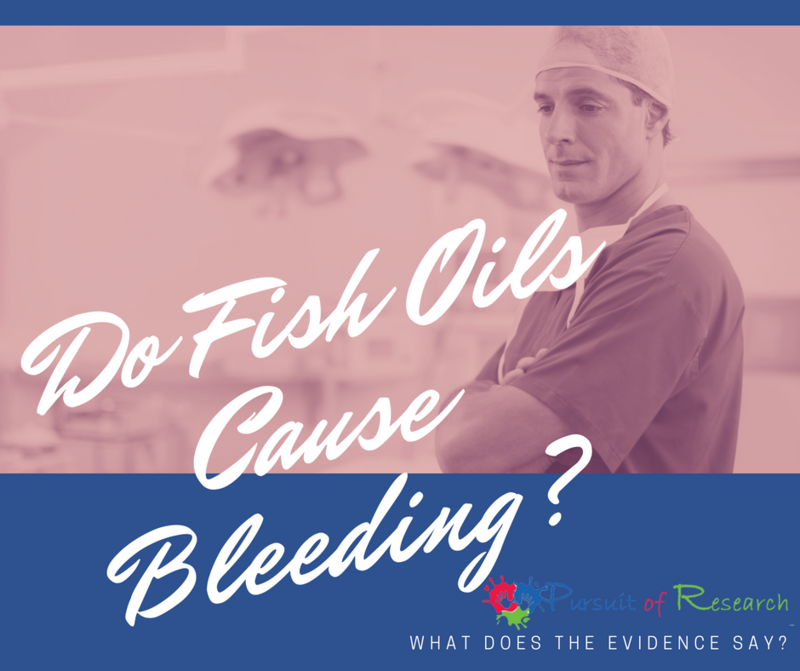 Dr. Richardson quote answers the question do fish oil cause bleeding? 1. Harris, W.S. Expert opinion: Omega-3 fatty acids and bleeding—Cause for concern? Report of the National Lipid Association’s Safety Task Force: The Nonstatins. 99.6A (2007): 44C-6C. March 19, 2007. 2. Braun, L. Fish oils and bleeding: ‘Is there a clinically significant risk? BioCeuticals. August 19, 2013. 3. Jeansen,S., Witkamp, R.F., Garthoff, J.A., van Helvoort, A., Calder, P.C. Fish oil LC-PUFAs do not affect blood coagulation parameters and bleeding manifestations: Analysis of 8 clinical studies with selected patient groups on omega-3-enriched medical nutrition. Clinical Nutrition (2017). pii: S0261-5614(17)30118-8. Author and President of The Cherab Foundation Lisa Geng got her start as a designer, patented inventor, and creator in the fashion, toy, and film industries, but after the early diagnosis of her young children with diagnosis including severe apraxia, hypotonia, sensory processing disorder, ADHD, CAPD, she entered the world of nonprofit, pilot studies, and advocacy. As the mother of two “late talkers,” she is the founder and president of the nonprofit CHERAB Foundation, co-author of the acclaimed book, The Late Talker, (St Martin’s Press 2003), and holds two patents and patents pending on IQed nutritional composition. Lisa has been serving as a parent advocate on an AAN Immunization Panel since 2015 and is a member of CUE through Cochrane US. Lisa is currently working on a second book, The Late Talker Grows Up and serves as a Late Talkers, Silent Voices executive producer. She lives on the Treasure Coast of Florida.